Google is testing waters to adding Google Now functionality to the Google home page according to Alex Chitu from the Google Operating System blog. Google Now is currently available for Android users and Google Glass users, “Google Now uses your location to show relevant information like weather, traffic conditions, and nearby places. Google can know your location based on your browser settings and it already knows your time and may be able to use your Gmail emails. 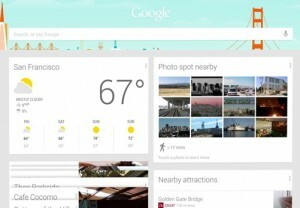 It can tie it all together and give you Google Now functionality directly on the Google home page.